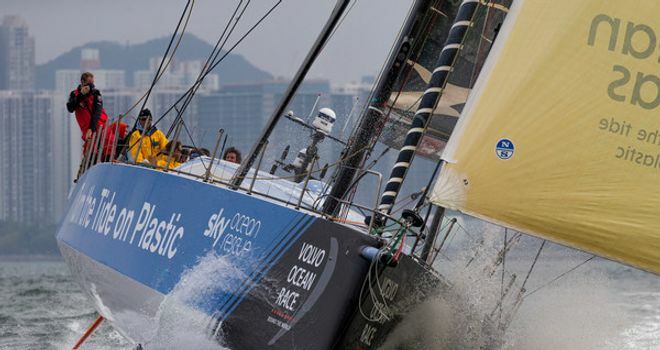 We have just reached the halfway stage on Turn the Tide on Plastic for Leg 8, sailing from Itajai in Brazil to Newport in the USA. With just 2500 miles to go, I thought this was reason enough to celebrate and let you know what has been going on. The start of the leg was all upwind sailing spending most of our time heading east, despite our destination being to the North-West. The reason being we had to try and get around the corner of Brazil before we could head in a better direction. We saw a lot of the other boats but very little else. It was not until we closed the coastline that we saw more life - other commercial shipping, fishing boats and indeed our own flying fish. It is the rainy season in Brazil and we had our own rainy season on the boat! Intense squalls with strong winds and rain and big changes of direction - these were good opportunities for a shower, as well as trying to get away from our competitors! At the corner we encountered a favourable current helping us go in the right direction and we used this to our best advantage. We were gybing along the continental shelf to get the best effect, but so were the rest of the fleet and we ended up in quite a battle, with four boats all within sight of each other. 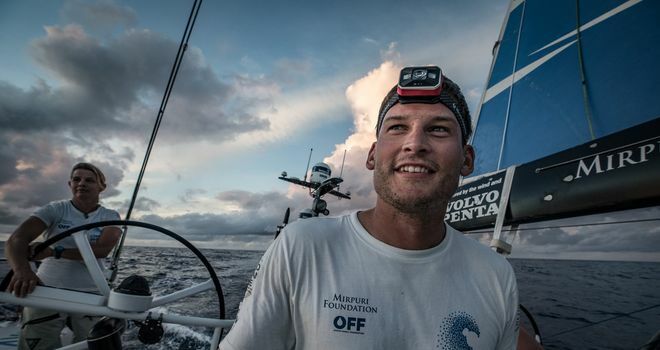 Once clear of the Brazilian coastline we headed north to cross the equator, returning to the Northern hemisphere for the final time this race and on to our next battle - the dreaded Doldrums. Given the time of year and our location - far away to the west - The Doldrums were very inactive. We did not have to endure the large areas of calm that we faced previously. This time it was more an area of large cloud mass, giving very inconsistent wind strength and direction. Finally, the wind direction stabilised and the strength grew and we believed we had made it. We had found our North-East trade winds that we were going to sail along in for the next five days. Now it is all about going fast and staying with the pack. 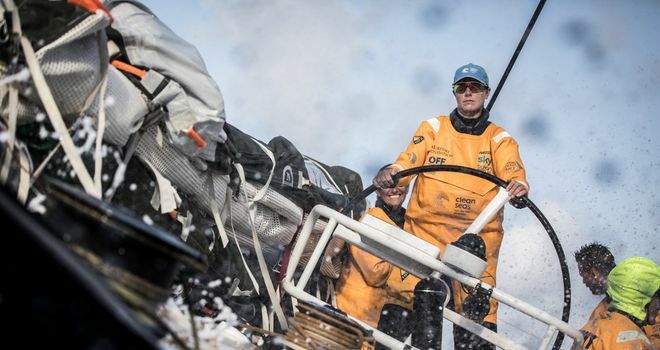 We are near the front of the fleet and our intention is to stay there, sailing as fast as we can and as consistently as we can. I feel like we are being chased down by a pack of wolves! Each position report the back of the fleet close in a little and then they stay the same, occasionally they move away again. 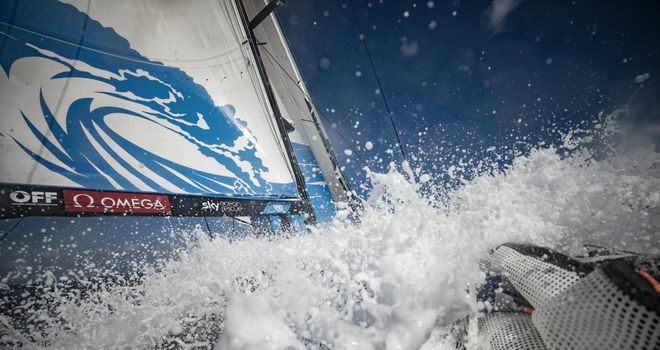 We are all enjoying the same conditions and the same fast angle of sail so there is very little room to change. We have passed the midway stage and have to push hard for another week until we arrive. The talk of pancakes has already begun on board! The final 800 miles will be tough as we will have a couple of weather systems to deal with. I hope this does not shake the pack too much as we are doing well this leg and we hope that stays the same when we arrive. Our chance again to claim a podium position? It has been so close now for three legs surely this is our chance?! It is always the final miles that are the toughest, so we take each day as it comes. At the moment we are going fast and getting battered by waves and spray every watch. Our eyes are sore and our skin is slightly sunburned but we are smiling as we love what we do. The temperatures are high below deck and are tropical above deck as we pass by the Caribbean. In fact, it will only be the final two days where the temperatures will plummet as we cross the Gulf Stream when the water temperature will drop from 22 degrees to 7 degrees! So follow our progress and cheer us on as we battle our way to the north aiming for the sailing hub of Newport, Rhode Island, USA.